The Diva's Weekly Challenge #171: "Beads of Courage"
The Beads of Courage programme helps support children and their families who are coping with life threatening or chronic illnesses. Glass beads are collected to show courage for the children's bravery going through treatment. So we are tangled up with beads this week! Oh my, this is simply stunning! Is that a Renaissance tile? Your work is so inspirational. Wow. Stunning and I love how the Mooka frames the piece. It is hard to put into words how delightful this design is. Beautiful piece. The true touch of a Master. Every line and shape needed to be there, no more, no less. Thank you Shelly. 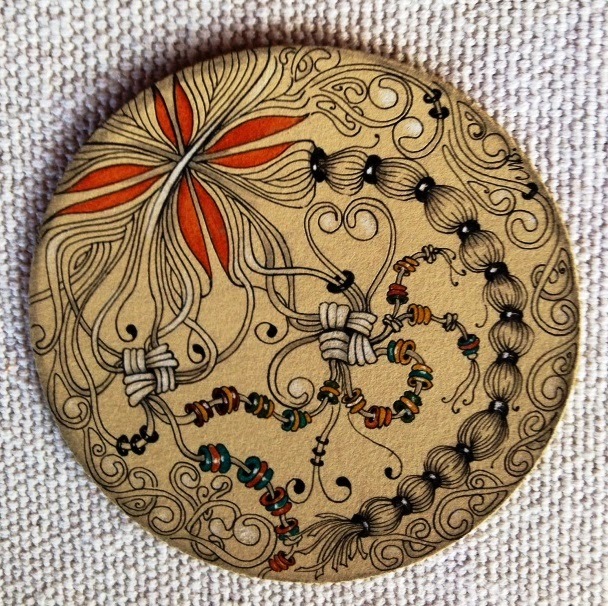 Shelly, this is a very colorful and graceful Zendala of beads. As usual, your artwork is superbly done...love your work. Absolutely gorgeous. Great tangles, color and line work, and perfect shading and highlighting. So beautiful and enrobing (for lack of a better word)! Your interpretation, execution and choice of colouring are always exquisite! The addition of the splash of red is stunning. Love the dimension that you created with this and the splash of color sets it off. You are amazing!